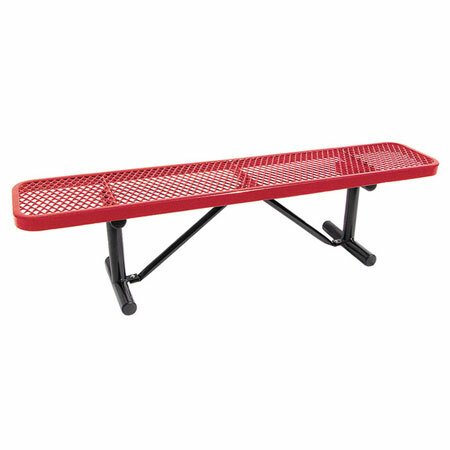 Backless benches are ideal for practically any indoor or outdoor area that needs a simple, comfortable place to sit. Athletic and sporting facilities use them for locker room and sideline seating. Shopping malls use them for indoor and outdoor seating. They are also common in city parks, public school bus stops, college buildings and outdoor areas, office parks, and transportation centers. Backless benches feature a rugged construction and treatment process that makes them impervious to climatic extremes, variable weather conditions, and vandalism. Each bench features a perforated metal seat welded to a sturdy metal frame with legs. 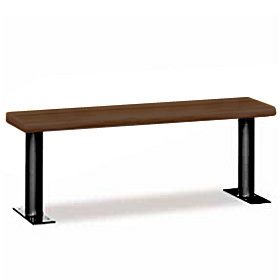 Rather than having complicated support arms, many benches are designed with curved, u-like bars that elevate slightly above the end of the bench. This provides sufficient arm rest or hand grip for people seated at the end of the structure. To protect the metal from rust and corrosion, thermoplastic powder coating is used to cover the entirety of its surface. Adhesion of this substance to the metal is first achieved by giving the bench an electrical charge, then charging the particles in the coating with an opposing charge. The resulting magnetic field makes the bond between the two very strong. The adhesion is then strengthened even more by baking the backless bench at high temperatures. This hardens and thickens the coat into a secondary surface that will not peel or crack. It is also resistant to spray painting, so if any graffiti damage occurs, the paint can be wiped off with standard cleaners. If a vandal cuts the material, a heat gun can be applied to reseal the opening. Thermoplastic also has a UV component that is highly resistant to fading. Backless benches are constructed with pre-drilled holes that allow for three mounting options. The first and most basic type of mounting is the portable mount. This allows for the bench to be relocated. While this is the most convenient method of mounting, there is always a risk of theft. Surface mounting is therefore a much more common method of bench mounting. Holes are first drilled into a concrete surface. Anchors are then inserted to hold the bench legs in place. The bench can still be relocated, if necessary, by unbolting the legs. The likelihood of theft, however, is greatly minimized due to the length of time and difficulty involved in disassembly. 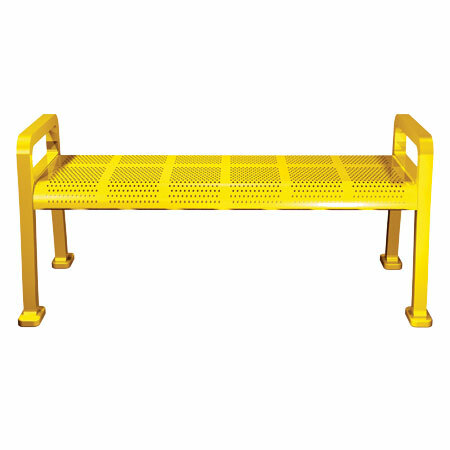 When a bench must be mounted directly into the ground, but there is no concrete surface to which to bolt it, in-ground mounting is required. This involves drilling holes in the ground. The legs of the bench, which are will be pre-configured with welding leg extensions, will be lowered into these holes. Wet concrete is then poured around the leg extensions and allowed to set the bench in place. 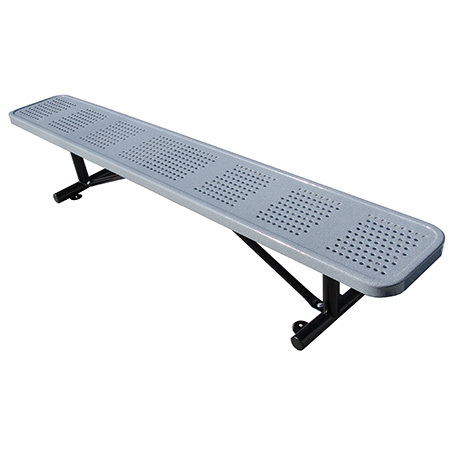 There are also backless benches made exclusively for use in athletic facilities. There are Indoor benches for locker rooms made from wood, metal, and plastic. Plastic is the most resistant to denting and scratching and is often preferred due to its high vandal resistance. 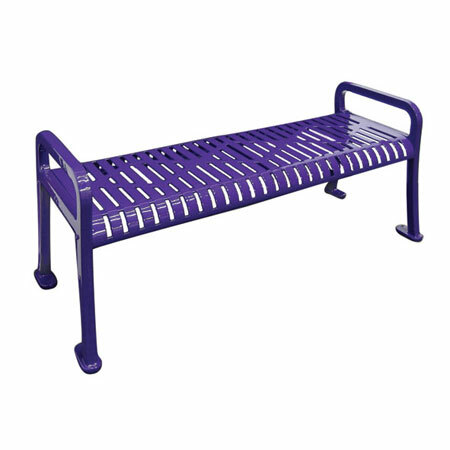 Aluminum benches are known for their comfort, and wood benches offer affordable price options. 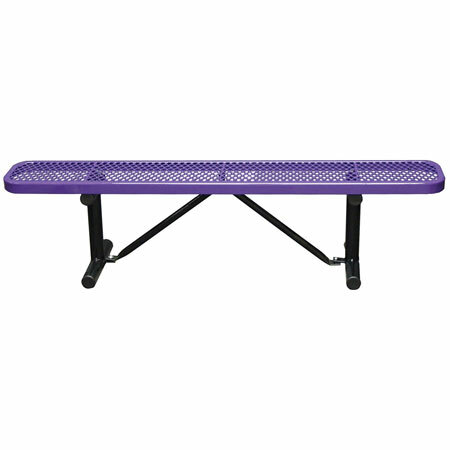 Outdoor benches for sideline seating include standard models that allow players to face in either direction while resting from the game. Waterproof models are also available, as well as benches with diamond-shaped metal perforations designed for maximum comfort. Outdoor backless benches are used for seating in many different places. We offer commercial benches at affordable prices.